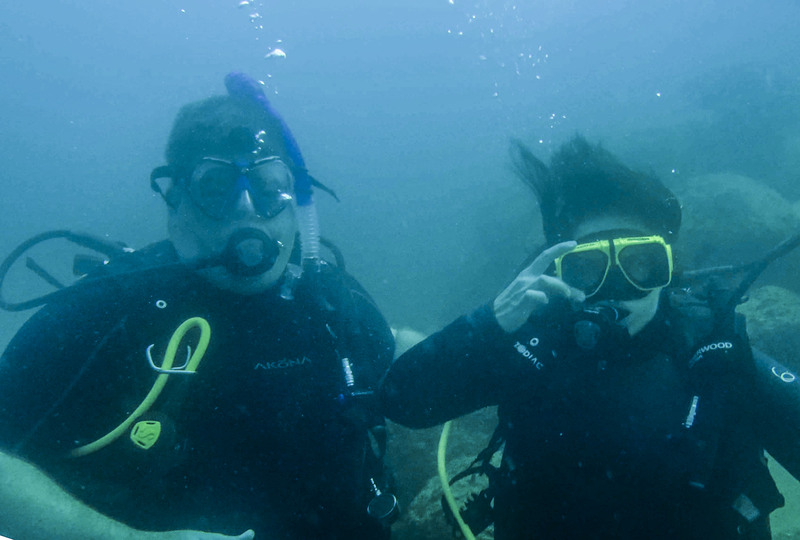 A couple of years ago PapaChef and I got scuba certified. Several members of my family are certified and enjoy going on trips together, so we figured there would be opportunities and we should just do it. Even though I am a swimmer–I had lessons from the time I was a baby and did swim team as a teenager–scuba diving was scary! Breathing underwater is very counter-intuitive. So is jumping into open water with 50 lbs of gear strapped to you. In fact, all if it is pretty much against nature. And on top of that, my ears have itty bitty canals and eustachian tubes, making it difficult to clear my ears (yeah, Dr verified). I pretty much spent my entire class experience riddled with anxiety. I passed, but one of my ears hurt pretty bad and it took a long time to feel like the water was gone from inside it. 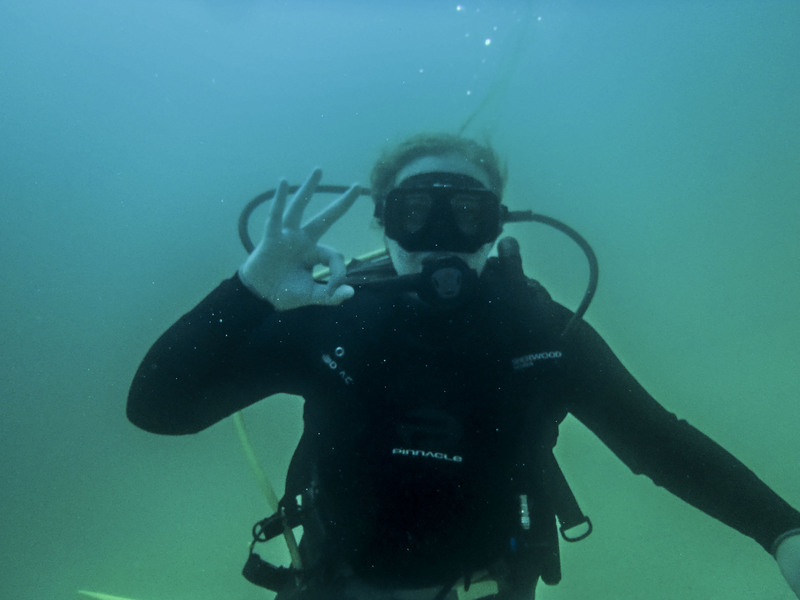 Needless to say, when I went diving for real in Hawaii I was pretty nervous. My first dive was a disaster. It was against a reclining coral wall, descending down to 90 feet. My ears were being a little uncooperative, so I was so slow getting down. For a beginner, trying to adjust my buoyancy with inconsistent depth and trying to clear my ears over and over as my depth changed was very challenging. Then, my BC jammed, began inflating, and I made an uncontrolled ascent to the top. I was ok, and according to the dive master, going much slower than I thought. The next dive in Hawaii was amazing–it was level ground, only about 30-40 feet deep, and we got to see massive sea turtles at a turtle cleaning station. So fast forward to Cabo 2013. We scheduled four dives months in advance, and months in advance, I started to fret. We did a scuba refresher course, which went ok, but I had a mask flooding incident I couldn’t manage and went to the top again (knowing it was no big deal in a 15 foot pool). All I could think of was my mask flooding and my uncontrolled ascent in Hawaii. And I was seriously freaking myself out. 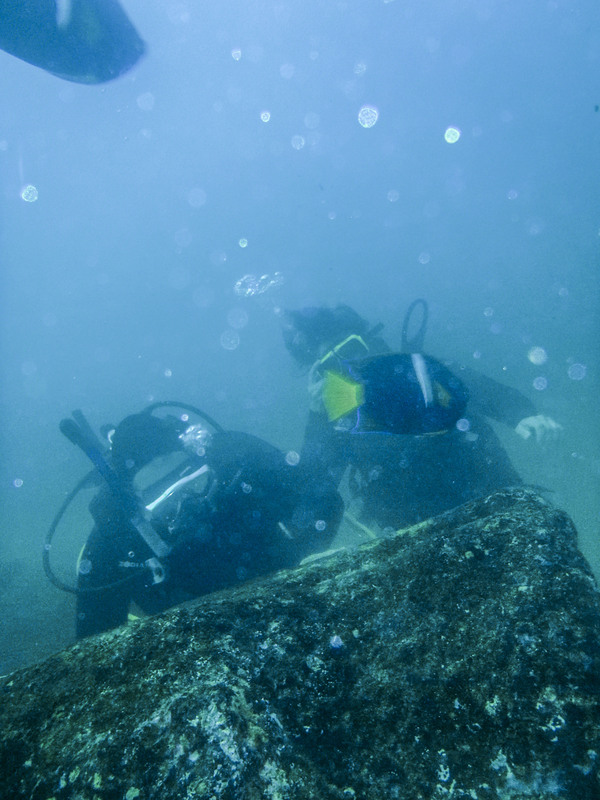 In Cabo, there are several dive sites, all kind of close together. One is called Pelican Rock, another called the North Wall. They are not particularly deep and easily in view of the beach and the famous rock formation called The Arch. 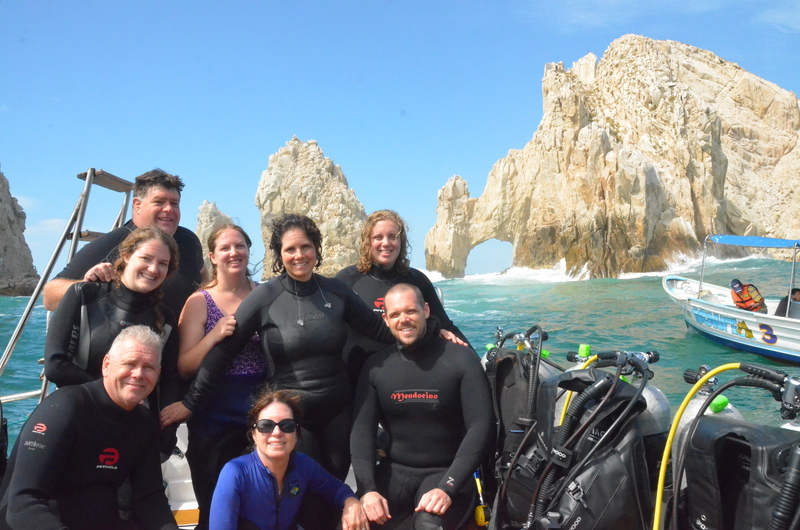 Our diving family: my Dad, stepmom, brother, husband, two SIL, and daughter. Famous Arch in the background. I was feeling very nervous, but OK. I stepped into the ocean, but I forgot to hold my mask. My mask flooded with salt water, and the water was quite cold, so between the two events I had a complete adrenalin rush which set me into a complete panic attack. I am not particularly prone to panic, but my poor body was sending very strong FIGHT or FLIGHT messages. Our dive master, Yayoi Imose with Dive Cabo, was fantastic. She was patient and calming. She had me breathe deeply and held my hand. Finally, I felt ready to descend. As soon as I started to go, my mask flooded and would not clear. This sent me into another panic, at which point I said I just couldn’t go–I had to get back on the boat. Strangely, my admitting this helped calm me. Yayoi asked the captain for another mask which he threw down to us. This one fit better and I experienced no flooding. Surprisingly, my ears behaved beautifully and I had no issues. I was very tense the whole time, but Yayoi held my hand THE ENTIRE DIVE. I am sure she realized I would not let go. So, I won’t say that the dive was pleasant, but I survived. I figured out that my mask NO LONGER FITS. I bought it before Hawaii, but I have lost some weight in my face, and now it is too big. The second dive went better; I still panicked a little, but I didn’t have to hold her hand the whole time. Instead, I made my husband hold it instead, which he was happy to do. Here is a picture of us. Notice how I am holding my mask on–so petrified it was going to fly off or flood, and somehow, I was convinced that if I held it I could prevent all of that. 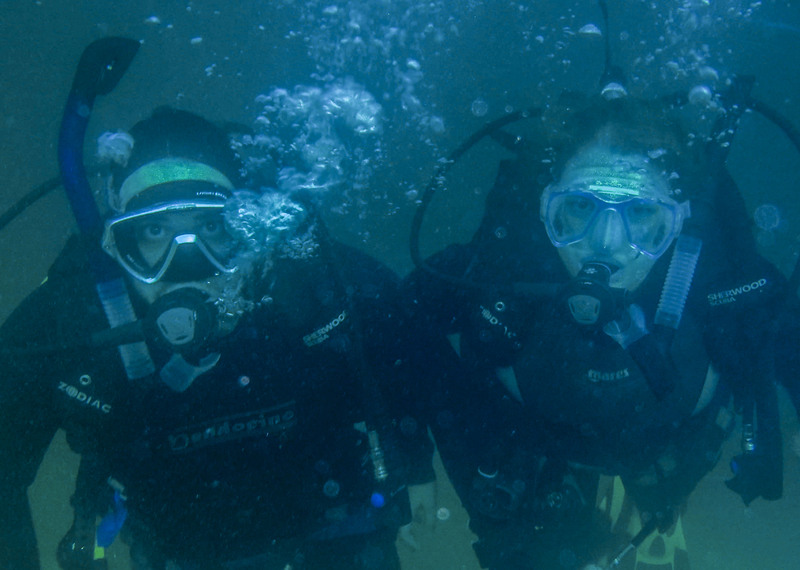 Our dive partners: my brother and sister-in-law. They are cool cats when it comes to diving. My 18 year old daughter had just gotten certified while away at college, and she dove like a natural; I was worried and anxious for her too but she did great! Thankfully she was in a different dive group so she didn’t have to see me being a nervous wreck. Of course, some of the sea creatures were very fun to see, but I was too preoccupied with my panic to truly enjoy it. 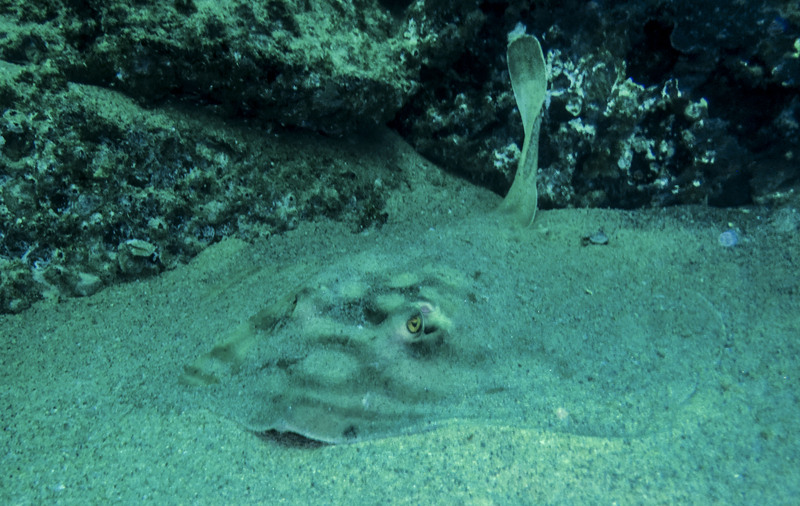 Here is a ray that was hiding in the sand. Here I am holding on to dear life to the Dive Master. The diving was not bad, but in Cabo in July the water tends to be cold and the visibility only 25 feet or so. One of the reasons the water is murky is because it is full of nutrients, making very diverse marine line possible. Much better diving in Cabo from Sept to Nov however–the water is more clear and much warmer (up to about 85 degrees). By the time our Friday dives rolled around I was ready to tackle it again (which I will discuss in another post). I am not sure I have completely battled my anxiety, but I have learned that I CAN do difficult things, even as a mom of four in my 40s. If you are diving in Cabo, I can definitely recommend Dive Cabo. Their prices were reasonable and the Diver Masters knowledgeable. And if you are a new diver, request Yayoi. She was fantastic. Not all dive masters are patient with new divers, but she was so great. I really liked how Dive Cabo generally only has 4 divers to one dive master, whereas a lot of shops have much bigger groups. My husband is already planning our next dive trip. I need to go more often so it is not like starting from scratch every time. I made a lot of progress this trip, and I look forward to LESS ANXIETY and more fun for the future. Wow, you’re brave! I don’t think anyone could get me to do that. I didn’t know you were a swimmer in HS! Yeah…I did swim team for many years. I had asthma (still do, but it is much better), and swimming is a more asthma friendly exercise for some people. have a look @ this…. It´s a Padi dive specialty course is expressly created for people with concerns and fears in context to scuba diving and water. Awesome. I will definitely look into this.